Kite point is on the sound side of NC-12, just south of the Haulover parking lot. With this new designation, today's visitors to Hatteras Island, particularly visitors during the spring and fall shoulder seasons, will find the beach covered with spread out kites and rigging, and the waters congested with gigantic colorful kites zooming in every direction. Because of this remarkable sight, all with the statuesque Cape Hatteras Lighthouse barely visible in the background, Hatteras Island visitors of all varieties, whether they're avid kiteboarders or not, will appreciate the spectacular view. The soundside beaches in between Buxton and Avon have always been popular with windsurfers. Making an initial appearance in the 1970s and 1980s, windsurfers from around the country and beyond began making yearly expeditions to Canadian Hole, a small soundside parking area in between the two villages that offers wide beaches for set-up and phenomenal access to the open waters of the Pamlico Sound. It wasn't until the 1990s and early 2000s that the sport of kiteboarding began to literally take-off, and early kiteboarders, many of which were also windsurfers, headed to Canadian Hole to enjoy the exceptional waterfront launching point. But as the sport of kiteboarding grew in popularity, and more and more visitors were flocking to Canadian Hole, it became evident that a little more elbow room would come in handy. This is how Kite Point came to fruition. Located literally adjacent to the Canadian Hole soundside parking area, but providing kiteboarders will plenty of room for set-up, (as well as a small stretch of 4WD accessible beach to make lugging equipment along a breeze), Kite Point became the new destination of choice for kiteboarders from around the globe. The exact geographical borders of Kite Point are hard to define and more or less depend on the number of kiteboarders that are on the beach that day. A small soundside access ramp is located approximately 1 mile south of Canadian Hole's parking area, which allows Kite Point visitors to quickly access the soundfront beach just a few yards away, and park along the water's edge. Next to this access ramp is a sandy parking area which can accommodate a half dozen or so vehicles, although many other cars can be spotted simply parked along NC Highway 12 when the kiteboarding conditions are exceptional. This region of the Pamlico Sound is considered exceptional for kiteboarders for a number of reasons. For one, the Pamlico Sound is bordered by Avon Village to the north and Buxton, Frisco and Hatteras to the south, allowing kiteboarders both a scenic scoot across the sound as well as a multitude of launching and landing points. In addition, the waters off the beach of Kite Point remain at 2' to 4' ft. depths for hundreds of feet, making take-off a breeze from the shoreline. Set-up and launching is even easier with the fact that it's just a quick walk from a roadside parking spot or beachfront location to the miles of open water soundfront. Finally, Kite Point experiences the same exceptional sound-based watersports conditions the rest of Hatteras Island enjoys, with seasonally consistent breezy winds and lukewarm water temps. With all of these factors in mind, it's no wonder that die-hard kiteboarders will literally drive for thousands of miles just to enjoy a day and evening exploring the open waters off of Kite Point. It should be noted, however, that kiteboarders aren't the only visitors who will enjoy a visit to Kite Point. In recent years, as kayaking and stand up paddle boarding have made a splash on the local water sports scene, this beach has become popular with lovers of all soundside sports. Ideal for practicing and newcomers, the shallow waters and easy launch off the beach access is perfect for kayakers and boarders who are just starting out, and could benefit from a wide section of watery training grounds. Fishermen in small skiffs, that can effectively run in shallow waters, can also often be spotted just off the beach, fishing for small mullets, crabs, flounder, and even tasty sheepshead that can be found in the Pamlico Sound waters, depending on the season. Beachcombers can also found hounding around the areas along Kite Point, as the gentle sound waters often produce perfectly intact smaller finds, such as olive shells, periwinkles, and augers, as well as bits of ancient sea glass that are relics from the surrounding villages. The best time to go beachcombing on this stretch is right after a "good blow " or a coastal storm, when the sound waters have calmed down just enough to reveal a treasure trove of recently unearthed finds along the beach. Photographers should also make a stop by Kite Point for some quintessential Hatteras-style photo opts. Patient photographers can catch incredible shots of kiteboarders mid-air with the Cape Hatteras lighthouse in the background, and colorful kites dotted throughout the sky. This landscape is only enhanced around sunset, when the entire sound and the skies above it are ablaze with deep purples, orange, and pink hues. Speaking of sunsets, any visitor to Hatteras Island is all but required to take in a gorgeous soundfront sunset, and Kite Point makes it an easy venture. With one of the island's only 4WD accessible paths towards the soundfront north of Avon, vacationers with limited mobility can simply pull up to the beach and enjoy the front row view, without even leaving their vehicle. Additionally, visitors can stroll north or south to find their own private sandy patch of beach to spread out a blanket and a makeshift picnic, and unwind with unobstructed open water Pamlico Sound vistas. Kite Point is also an ideal soundside beach for summer vacationers who want a break from the waves, or who have young ones in tow. In the summer months, this stretch of shoreline isn't crowded with kiteboarders, and as a result, there are wide patches of empty sand just waiting for a beach blanket. The locale is especially ideal for the youngest members of your family, as the shallow sound bottom and non-existent waves allow kids to play without fear of the larger oceanside breakers. Regardless of your sporting or beach scene, Kite Point has something to offer everyone, regardless of the season, making it a must-see locale for southern Outer Banks vacationers. The easiest way to access Kite Point, especially for boarders with bulky equipment, is to head to the beach via the soundside 4WD access ramp. Before heading to the beach, be sure and stop by the National Park Service (NPS) office adjacent to the Cape Hatteras Lighthouse in Buxton. A beach driving permit is required on the Cape Hatteras National Seashore, and can be obtained in person by watching a 10 minute video and paying a weekly or annual fee. Make sure you only drive a 4wd vehicle on this beach. The sand may be hard packed and easy to maneuver, especially compared to neighboring oceanside beaches, but there are soft spots along the way, both on the trail itself and along the shoreline. When it comes to potentially getting stuck on the sand on Hatteras Island, it's always better safe than sorry. Vehicles should also be careful parking along the side of NC Highway 12. Be sure that you park well off the highway and the adjacent bike lane for safety, but make sure you're not parking in a patch of soft deep sand. On the Outer Banks, sometimes it's just as easy to get stuck simply parked along the sandy side of the road as it is driving along the beach. Kiteboarders should be mindful of the power lines that run along the length of NC Highway 12, and guide their kites and equipment accordingly. A kite stuck in the power lines can actually cause an island-wide power outage, (and actually has in the past), so be sure and give the easy-to-spot power lines a wide berth while in and out of the water. Folks who want a secluded and easy-to-get to soundside beach should take a visit to Kite Point in the summer and winter months. On a calm day with little wind, the beach is almost deserted and wide open for beachgoers who simply want to set up a lounge chair at the water's edge and relax. Just keep an eye out on the soundside in between Avon and Buxton to see if the beach is conducive to privacy seeking vacationers. Because this stretch of soundfront is completely visible from NC Highway 12, it will be easy to see if Kite Point is crowded or not. What began as a remote and little-known kiteboarding oasis is now arguably one of Hatteras Island's most popular soundside beaches. Kite Point is an ideal retreat in the shoulder seasons for kiteboarders and watersports lovers from around the world, and a nice respite on those perfectly calm summer days for vacationers who just want a wide stretch of saltwater to dip their toes into. Easily accessible and enjoyable in all seasons, Hatteras Island vacationers are encouraged to pull over, swing by, and see what all the fuss is about. Chances are, if you hit Kite Point around sunset when the kites are swarming against the sky, you'll be back again and again to simply spread out a beach blanket, relax, and enjoy the show. Kite Point is a stretch of soundside beach that is known as one of the most popular public kiteboarding destinations on Hatteras Island. Sandwiched in between the island towns of Avon and Buxton, the area experiences consistent solid kiteboarding conditions in the late fall and spring months for kiteboarders, with room on the beach for rigging and launching. Kite Point is located about halfway in between the towns of Avon and Buxton. The unmarked beach area is located on the soundside of NC Highway 12. Is Kite Point on the ocean or sound? Kite Point is located on the Pamlico Sound, although it is just a minute or two walk away from the oceanfront, which is just across NC Highway 12. 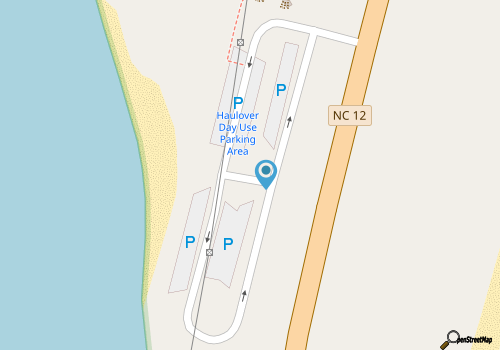 Where can you park at Kite Point? Visitors can park on the edge of NC Highway 12, or in wide and rugged parking spots that border the path to the beach for 4WD vehicles. Visitors should stay alert for the No Parking signs on the side of the highway that are close to Kite Point, and should also be careful parking on the highway borders, as it can be easy to get stuck in patches of soft, deep sand. How do you get to Kite Point? Visitors can reach Kite Point by heading two miles north of Buxton, or two miles south of Avon. When kiteboarding conditions are good, a line of vehicles on the soundside of Highway 12 will indicate that you have found the right spot. What are the kiteboarding conditions like at Kite Point? Kiteboarding conditions at Kite Point can be exceptional, depending on the wind. The best time to head to Kite Point is when there is a steady northeast wind, (when the somewhat protected area is less choppy than other soundside beaches), and when there is a clean and steady summer southwest wind. What are the kiteboarding hazards at Kite Point? Kiteboarders will want to watch for the line of power lines that border NC Highway 12, and which are dangerously close to the Kite Point shoreline. Can you get to the oceanfront beach from Kite Point? Visitors can hop across NC Highway 12 to reach the beach, and are advised to look for the sandy paths that veer across the dunes, and which are located close to the Kite Point shoreline. Kite Point is owned and managed by the National Park Service, as it is a part of the extensive Cape Hatteras National Seashore. How did Kite Point get its name? It’s no big mystery that Kite Point was named after the kiteboarders who frequent the area. As kiteboarding grew in popularity on Hatteras Island, kiteboarders staked out their own informal shoreline just south of Canadian Hole, which has always been a favorite spot for windsurfers. Can you drive on the beach at Kite Point? Visitors can drive on the beaches that border Kite Point. A beach driving permit from the National Park Service is required to drive on the soundside shoreline, and any beach within the Cape Hatteras National Seashore. Do you need a permit to drive on Kite Point? A permit from the National Park Service is required to drive on the Kite Point beaches. Permits can be picked up in-person at the ranger station near the Cape Hatteras Lighthouse, or online on the National Park Service website. Are there restrooms at Kite Point? Are there showers at Kite Point? There are no showers or restroom facilities at Kite Point, however, visitors can head just north to the Haulover day use area, where seasonal restrooms and showers can be found. Can you swim at Kite Point? Kite Point borders the edge of the Pamlico Sound, and as such, the shoreline has calm and shallow waters that remain at waist-high levels for hundreds of yards. It can be a good spot for young visitors who want to splash close to shore, however visitors will want to use caution as the area is often congregated with dozens of speedy kiteboarders when the wind conditions are right. Can you kiteboard at Kite Point? Kite Point is recognized as one of the top kiteboarding spots on Hatteras Island. As such, the beach is always popular with local and visiting kiteboarders alike. Can you windsurf at Kite Point? Windsurfers can certainly enjoy exceptional wind and water conditions at Kite Point, but should note that the shoreline can be heavy with kiteboarding traffic. Windsurfers tend to head just north of Kite Point, to Canadian Hole, which has been an informal but established windsurfing destination for decades. Can you fish at Kite Point? Because the waters that border Kite Point are shallow and calm for hundreds of yards, it can be a decent spot for fishermen who want to reach a soundside beach via a 4WD vehicle, and easily cast a line. Anglers will want to watch for kiteboarders, who flock to this popular destination for watersports. Is there a kayak launch at Kite Point? There is no kayak launching spot for kayakers, however the sandy beaches and shallow waters make it easy to paddle out into the sound. Paddlers will want to watch out for the speedy kiteboarders, however, and may find that the nearby Canadian Hole is a better spot to launch and explore without excess traffic on the water. Can you stand-up paddle board at Kite Point? Visitors can certainly stand-up paddle board at Kite Point, however when it’s crowded with kiteboarders, SUP fans may find that they have more elbow room at Canadian Hole, which is located just north of the Kite Point shoreline. Is there a boat launch at Kite Point? There is no boat launch at or near Kite Point, as the waters immediately bordering the soundside shoreline are generally too shallow to navigate with a motorized vessel. Are there shells at Kite Point? Kite Point can have decent shelling, with piles of shells that wash up close to shore. The shells are generally older and fossilized shells that have been buried for hundreds of years, which gives them a generalized gray or white color. Shell seekers will want to look out for hermit crabs, which can be abundant in the area, as well as algae or sea grasses which tend to stick to the shells close to shore. How far is Kite Point from Avon? Kite Point is roughly two miles from the southern edge of Avon. How far is Kite Point from Buxton? The northern border of Buxton is roughly two miles away from Kite Point. Can you camp at Kite Point? Overnight camping is not allowed at Kite Point or any of the soundside beaches within the Cape Hatteras National Seashore. How shallow is the sound at Kite Point? The sound immediately bordering the beach is ankle to knee high, and remains relatively shallow, with waters waist deep at the most, for several hundred yards. Visitors will have to cruise well into the Pamlico Sound to find waters that are head high or more. Are there waves at Kite Point? Because Kite Point is relatively protected by the borders of southern Hatteras Island, the area rarely has waves. If there are high winds, visitors may experience choppy waves in the 1-2 ft. high range at most. Is there seaweed on the Kite Point beaches? Seaweed tends to wash ashore on Kite Point, as well as most of the soundside beaches on Hatteras Island, and is often found in patches or clusters on the water’s edge. On windy days, kiteboarders may also find free-floating seaweed throughout the Pamlico Sound. When is the best time to kiteboard at Kite Point? Kiteboarders head to Kite Point in the fall and spring months, particularly in the months of October, November, March and April, when the winds are at their reliably best. The area can be popular in the summer as well, however, especially if there is a stronger than normal southwest wind. When is the best time to visit Kite Point? Kiteboarders will want to head to Kite Point in the fall and spring to catch the steady and generally northeast winds. (The area can be a great spot in the winter too when winds are higher, as it’s relatively protected from unsavory wind and water conditions.) Beachgoers will want to check out Kite Point in the summer on days without wind, when the beaches are crowded with families and fishermen.